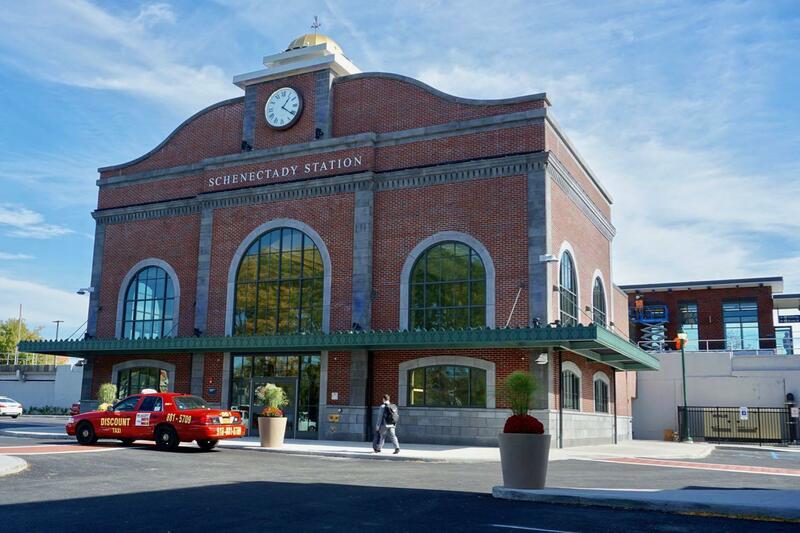 In a bit of a surprise the new Schenectady train station opened this past Wednesday, a few weeks ahead of the announced schedule. The $23 million station is the replacement for the old 1970s station that was demolished last year. We had a few free minutes in downtown Schenectady today, so we stopped by to gawk at the station. It's small, but nice. And it has that new station smell. We've included a handful of photos if you'd like to have a look. 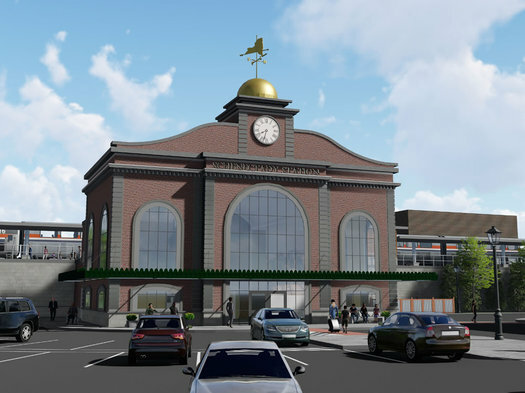 The design is said to be inspired by the old-old Schenectady train station -- Schenectady Union Station, the one built in 1910 -- that was knocked down in 1971. For a while Schenectady's train service was moved to a stop in Colonie. See Carl's history of the demise of the old-old station. As nice as the new station is, the best thing about it might be its location downtown just off the corner of Erie Boulevard and State Street. Of the Capital Region's four core cities, Schenectady is the only one that still has an operating train station right in its downtown. It's a reminder of what could have been for a place like Albany. It's kind of great that you can walk to a train in the heart of Manhattan, say, and hop off right in downtown Schenectady and walk to a destination there. 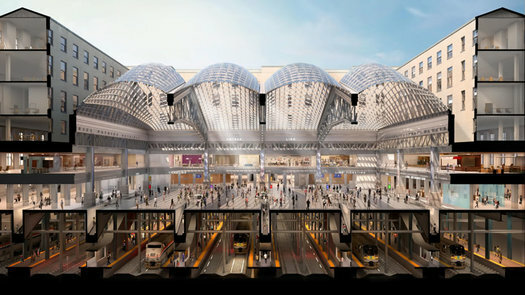 That image above is a rendering of the new train station planned for Schenectady. 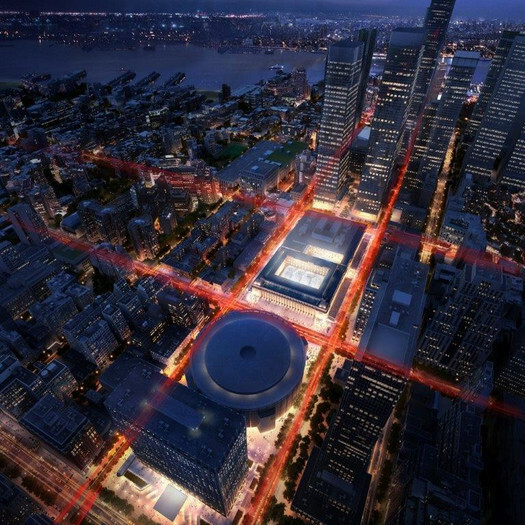 There are a few more renderings after the jump if you're curious. This new design looks like it might be more aesthetically attractive than the first one. It's scheduled to be completed by the end of 2018. Maybe you saw this Youtube clip of an Amtrak train plowing into the post-blizzard snow at Rhinecliff. It kind of sums up the week. The Gulf situation is a miniature version of the chicken-and-egg question that bedevils Amtrak as a whole: Is it a waste of money because there isn't sufficient demand for trains? Or is there insufficient demand for trains because we haven't spent the money to create a great rail system? Outside of the Northeast Corridor, the tracks Amtrak uses are almost all owned by freight railroads. CSX, Union Pacific, and a handful of other behemoths naturally hog them, which contributes to Amtrak's chronic tardiness, which in turn dissuades passengers from taking Amtrak. As a result, Congress cites Amtrak's low-ridership numbers as a reason not to grant it larger subsidies, which of course are exactly what Amtrak would need in order to purchase its own train tracks. Commenting on the vicious cycle, [former Amtrak chairman] John Robert Smith says: "You can't disinvest in something and then beat it to death because it doesn't perform." There's already relatively strong demand for train service in the Northeast, and Albany-Rensselaer is one of the busiest stations in the whole system. 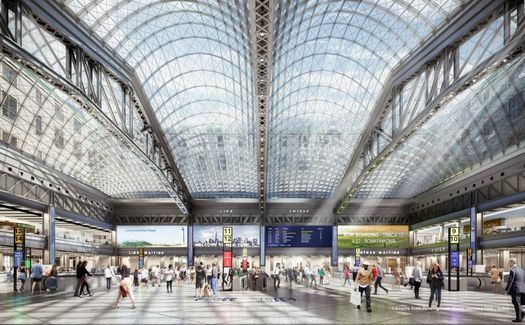 But if you could hop a high-speed train from here and reliably arrive at New York-Penn in, say, an hour and a half -- what might that do for ridership? And the same goes for other sorts of transportation systems. What if the Capital Region had a bus rapid transit system that was truly rapid and worked more like a subway system than a bus? What if people felt good about the state of local taxis? How would that affect demand for those modes? Anyway, that National Journal article includes some interesting bits about funding for Amtrak, some floated proposals for private high-speed rail in other parts of the country, and how political support for trains is maybe a bit more nuanced than you might expect. 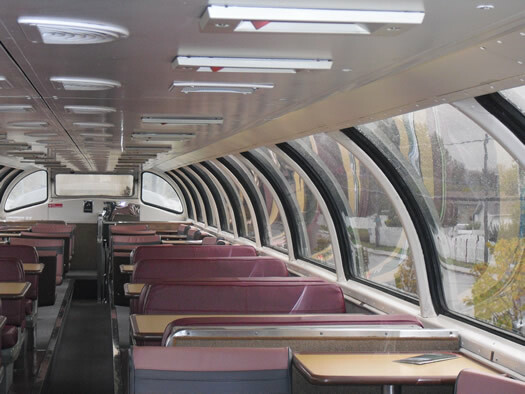 DOT says it costs Amtrak $100 million a year to operate the Empire, Adirondack, Maple Leaf, and Ethan Allen lines -- and the state will be picking up $22 million of that. The Empire Service -- between Albany and NYC -- is among the most-traveled Amtrak routes in the nation, but it's revenues didn't cover its expenses as recently as 2011. 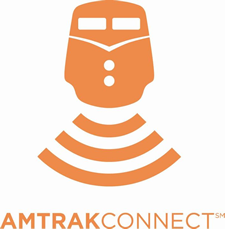 The new train location tracking system, available at Amtrak.com, provides near real-time train status of more than 300 daily trains, estimates of arrival times and station information - all in the context of the Amtrak national system map. Checking on train status is the second most popular action on Amtrak.com, just after purchasing tickets. In addition to helping passengers plan travel, this new travel resource is an excellent tool for those planning the arrival or departure of family and friends. Users can search for information by train number or name, city name and station name or code. That's a screengrab above of the Empire Service from this afternoon. Amtrak announced this week that it set a one-month ridership record in July with 2.9 million passenger boardings, the most ever in the system's history. Fiscal-year-to-date ridership on the Empire Service through July was 894,616 -- up 1.2 percent compared the same period the year before. That also ranked #5 for most-traveled short distance corridor. After the jump, ridership numbers by line for July and year to date, sorted by ridership levels. The 26 routes traveling less than 400 miles make up the operationally efficient portion of the network. It includes the two most popular Northeast Corridor routes, the Acela and Northeast Regional, which operate between Boston and Washington D.C., including spurs into Virginia and western Massachusetts. The positive operating balance from these two routes--which currently do not receive direct state operating subsidies--were enough to offset the net operating costs of the other 24 short- distance routes. Those other sub-400 mile routes typically enjoy direct state support (even before the federal PRIIA legislation) and always serve at least one large metropolitan area. In total, these 26 corridors carried 83 percent of all system riders in 2012. 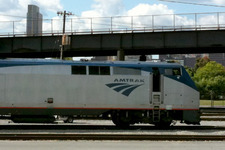 In fact, when taken all together Amtrak routes of 400 miles or less actually had a positive operating balance in 2011. The over-400 mile routes were in the red. The Brookings report also includes ridership numbers by metro area, not just by station. 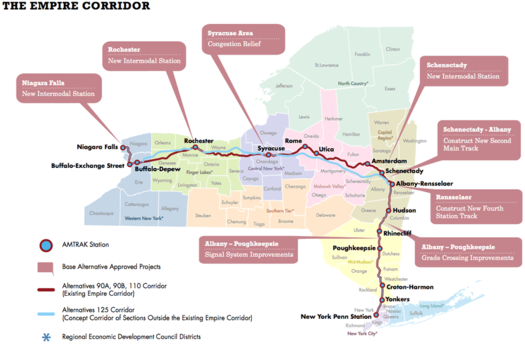 And it reports riders in Albany-Schenectady-Troy metro area to 862,737 in 2012 -- up 39 percent from 1997. 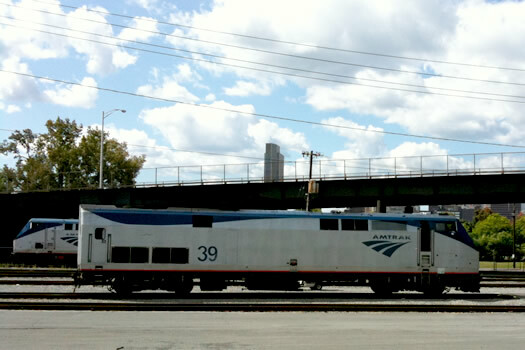 Amtrak had 31.2 million passengers in fiscal year 2012. The Brookings report notes the rail service is the fastest-growing domestic transportation mode over the last 15 years. Amtrak has released an updated version of its aspirations for high-speed rail along the Northeast Corridor. The short story: the new set of goals streamlines the plan, it's still expensive ($151 billion), and high-speed rail is still decades away. Transportation nation has a digest of the report. The Empire Corridor doesn't figure into this plan. 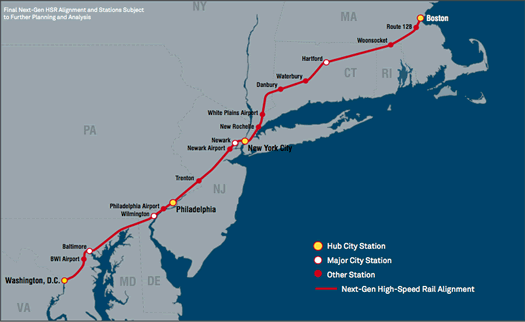 And despite whatever strong potential there might be for high-speed rail in the Hudson Valley, seeing Amtrak peg a target date for high-speed service along the Boston-NYC-DC corridor somewhere in the 2030-2040 range puts the chances of Albany-NYC service in perspective. That said, it doesn't have to be 220 mph or nothing. There are a lot of improvements that could potentially speed up, and smooth out, Empire Corridor service (examples: reducing bottlenecks, upgrading crossings). Higher-speed rail (say, 110 mph) should be a reasonable expectation. And people would ride it -- the Albany-Rensselaer station was the 9th busiest Amtrak station in the country last year. Getting faster service along the Hudson Valley, plus high-speed service along the Northeast Corridor, could make rail travel from here to places like Philadelphia and DC a lot more attractive. The proposed high-speed line along the Northeast Corridor. 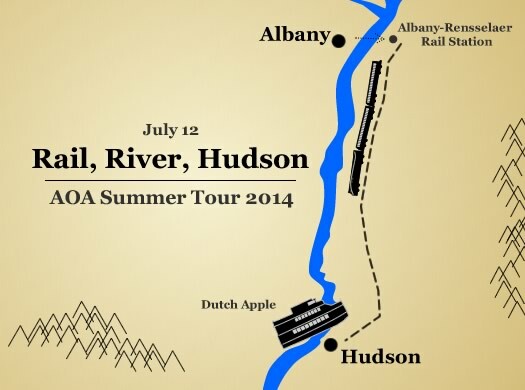 Sometimes we have this transit fantasy in which the Capital Region is connected to other cities via high-speed rail. Headed for New York City? One hour. Boston? A one-magazine trip. Buffalo? Why? (We kid. Sort of.) It could have a profound effect on this region. But the more this issue develops (or, you know, doesn't), we're thinking we might be traveling via jet pack before we get high-speed rail here. 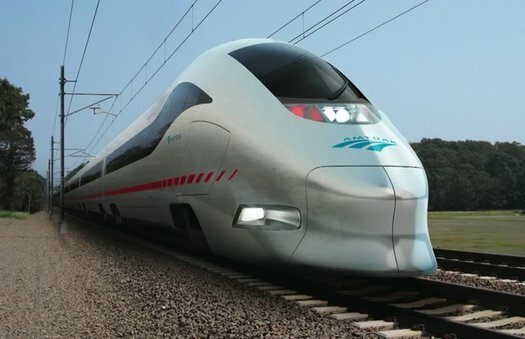 And despite all the talk about New York State hopping on board with high-speed rail, that's not looking likely, either. Of course, things change. The political situation could shift. The economy could (somehow) get a lot better. The price of oil could way up. Or not. So... where do we get fitted for a jet pack? If you don't catch this train soon, it'll be gone. Not that anyone ever really needs an excuse to go to MontrÃ©al, but here are two additional reasons to think about hopping a train north this fall. OK, you're heading to New York for a show, a game or a meeting, but you don't want to deal with traffic and parking so you opt for Amtrak. 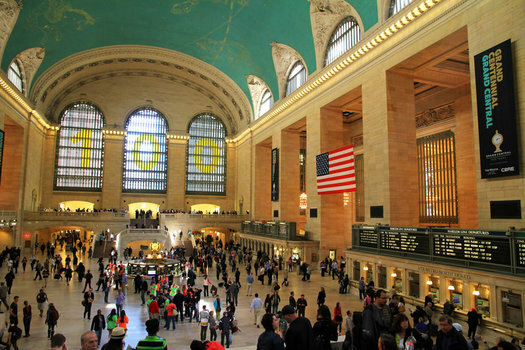 Riding the rails from the A-Town to The Big Apple is scenic and more relaxing than driving, but will you get there on time? The trip should take about 2 hours and 25 minutes. Anyone whose taken the train knows you're sort of at the mercy of the rail gods, though. But now there's amtrakdelays.com, aims to give us a little more control (or at least the illusion of control) over when we arrive. The site keeps delay records for Amtrak lines and calculates the the average delay for each train.